STIHL’s new RB 200 is the perfect gas pressure washer for cleaning decks, driveways and many other simple chores around the property. 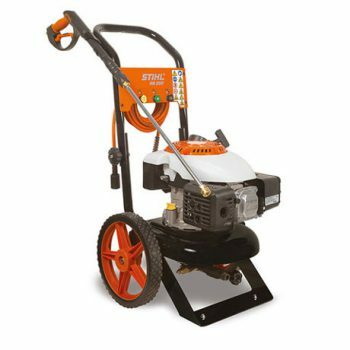 This unit features an operating pressure of 2,500 psi, a high quality powder coated, 1 1/4″ welded steel tube frame with folding handle bar, 12″ semi-pneumatic tires and an anodized manifold. The ergonomic trigger on the two-piece lance and gun assembly makes this unit easy and comfortable to use. Comes with a 25 ft. wire braided pressure hose.